A bishydrazone was prepared by reacting isatin monohydrazone with 2-hydroxy-1-naphthaldehyde and a series of metal complexes with this new ligand were synthesised by reaction with MnII, FeII, CoII, NiII, CuII and ZnII salts. The complexes were characterised on the basis of elemental analysis, molar conductance, magnetic susceptibility data, u.v.–visible, i.r., e.s.r. and n.m.r. spectral studies, wherever possible and applicable. 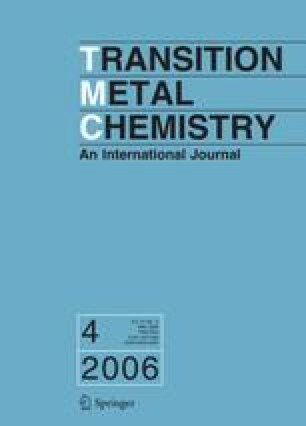 Analytical data reveal that the nickel(II), copper(II) and zinc(II) complexes possess 1:1 metal–ligand ratios and that manganese(II), iron(II) and cobalt (II) complexes exhibit 1:2 ratios. Infrared spectral data suggest that the bishydrazone behaves as a monobasic tridentate ligand with ONO donor sequence towards the metal ions. X-ray diffraction study of the copper(II) complex indicated an orthorhombic crystal lattice. The e.p.r. spectral data show that the metal–ligand bond has considerable covalent character. The electrochemical behaviour of the copper(II) complex was investigated by cyclic voltammetry (CV). Antibacterial tests of the ligand and the metal complexes were also carried out and it has been observed that the complexes are more potent bactericides than the ligand.